I've featured several angel cloud photos before, but this stunning photo taken by Cristina Catlin, in Topeka, Kansas, in 2008, is one of the most impressive. If you look closely you will see the figure in the middle appears to be cupping his hands as if in prayer. What Does The Next Three Months Hold For You? 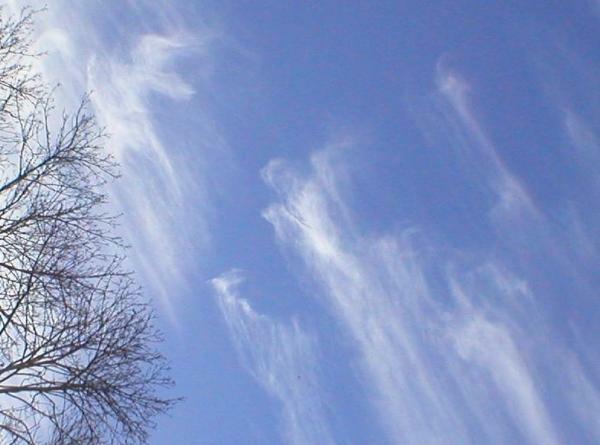 The picture of Angels in the sky I have seen weekly off and on now for about 2 months, November and now December this year of 2014, it is in the morning sky and mid noon sky, looks as if they are high above where I live, you are able to see the bodily outlines with them as they move in the air…Beautiful with a deep blessing. God is at work. Angels are Gods messengers..per the Bible. Angels are real….